Covering everything from translational concerns to different genres of biblical writing, How to Read the Bible for All Its Worth is used all around the world. In clear, simple language, it helps you accurately understand the different parts of the Bible-their meaning for ancient audiences and their implications for you today-so you can uncover the inexhaustible worth that is in God's Word. 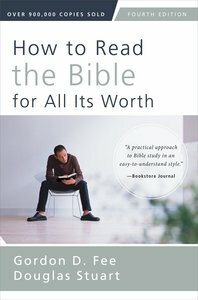 About "How to Read the Bible For All Its Worth"
Customer Reviews For "How to Read the Bible For All Its Worth"
This is a great book on biblical exegesis and hermeneutics. It's easy to read for the average person, so you don't have to study Theology to grasp the content, which is great. Gordon D. Fee and Douglas Stuart have done the church a great service by writing this tremendously helpful book. After the introductory chapters where the authors discuss the need for interpretation when reading the Bible and the importance of using a good translation, they proceed to help the reader understand the different genres that are found in the Bible (e.g. epistles, narratives, Acts, Gospels, Law, the Prophets, Psalms, Wisdom literature and apocalyptic literature). Fee and Stuart rightly insist that different genres require different sets of interpretive principles. For any Christian who wants to read their Bibles more intelligently, they cannot do without this book. Highly recommended! Great resource for those who want to study more about the Bible. It's readable and written in clear language. This book is not only for Bible College students, but also for every Christians that want to better understand the Bible. In this book, Gordon Fee teaches how to interpret the Bible, then goes in detail into how to read each book of the Bible effectively (The Epistles, The Gospel, OT Laws, Narrative, etc.). After reading this book, I understand more about how to read the Bible, and it has greatly helped me in my Bible Study.